Ⅰ.Anhui statistical yearbook-2018 comprehensively and systematically includes statistical data on economic and social aspects of the province,cities and counties in 2017.it focuses on the achievements of the five great developments of modemizaton of service provided by statistical departments in Anhui province,it is an informative annual that fully reflects the national economic and social development of Anhui province. Ⅱ.Financial production and consumption;finance,finance,insurance;price index;urban and rural people’s life;city profile;urban and rural areas;urban and rural areas;Tourism and science and technology;health and social services;culture and sports;public administration and others;provincial and county-level major;natural and environmental protection;agriculture;industry;construction;transportation and post and telecommunications;domestic trade;foreign economic trade;tourism;Economic indicators and ranking.Appendix part of the main:Anhui rural labor non-farm employment basic situation,the province’s basic situation of the town,the enterprise e-commerce situation.To help the reader understand and use the relevant data,each chapter is accompanied by a brief description and a description of the main indicators,and describes the statistical scope and statistical methods. Ⅲ.In this yearbook,We use the classification of national economic industries(GB/T4754-2011). Ⅳ.The units of measurement used in this book are internationally standardized measurement units. Ⅴ.Notations used in this book:(blank space) indicates that the figure is not large enough to be measured with the smallest unit in the table,or data are unknown or are not available;”#” indicates a major items of the total. 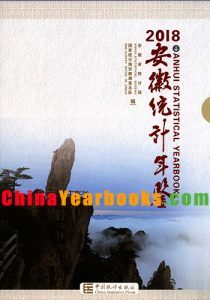 Ⅵ.Statistical discrepancies due to rounding are not adjusted in this book.Anhui Statistical Yearbook is compiled bilingually in Chinese and English and a magnetic CD-ROM has been published to form a complete set.